A-6A BuNo 154170 was accepted by the Navy in 1968 and first served with Attack Squadron 65 (VA-65) deploying to Vietnam aboard USS Kitty Hawk (CVA-63). It next served with VA-115 making multiple deployments aboard USS Midway (CV-41) and participating in Operation Linebacker, Operation Eagle Pull and supporting the evacuation of Saigon in Operation Frequent Wind. ‘170 was upgraded to an E model and in 1978 was sent to VA-196 deploying aboard USS Coral Sea (CV-43). 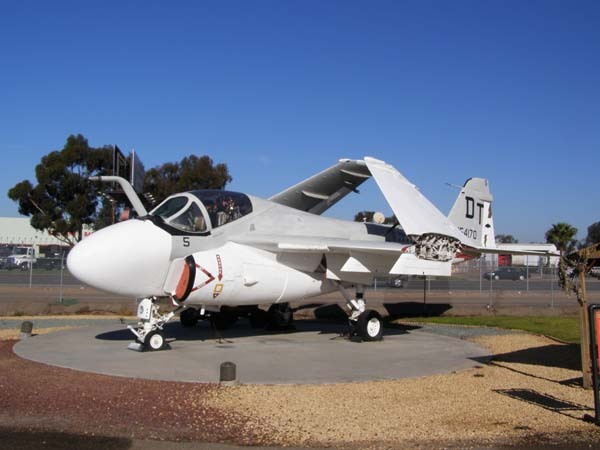 It joined the Marine Corps in 1984 with the “Bats” of VMA(AW)-242 at MCAS El Toro. In 1998 it became a weapons systems test platform with the “Vampires” of Air Development Squadron 5 (VX-5) and Naval Warfare Center at NAF China Lake, CA. This aircraft is on loan from the National Museum of the Marine Corps. The primary mission of the A-6 was acquiring and destroying surface targets in any weather, day or night. The A-6 provided Marines with an all weather strike capability for the first time. The cockpit used an unusual double pane windscreen and side-by- side seating arrangement in which the pilot sat in the left seat, while the bombardier/navigator sat to the right and slightly below. The incorporation of an additional crew member with separate responsibilities, along with a unique Cathode Ray Tube (CRT) display that provided a synthetic display of terrain ahead enabled low-level attack in all weather conditions. A total of 693 A-6s were built; 488 A-6As, 95 A-6Es, 71 A-6E TRAM (Target Recognition and Attack Multi-Sensor), 34 A-6E SWIP (Systems/Weapons Improvement Program), and 5 A-6Fs. 332 the last unit to fly the Intruder.